This tract is special. If you open the PDF you will see at the bottom of the back side "published at 511 and 512 Hall Building, Kansas City, Mo." The Hall Building was used by Unity from 1892 until they moved to Magee Street in 1898. You will also discover that this particular tract was used as an invitation for people to join in a class starting in January 1898. Thank you, Samuel Patrick ("Sammy") Smith for sharing this fantastic Unity resource! Practical Christianity is the application in all the affairs of life, of the doctrine of Jesus Christ. It explains how man may come into conscious relations with the Father, and what Jesus meant when he said:	“God is Spirit; and they that worship him must worship in spirit and truth.” — John 4, 24. R. V.
It explains the spiritual Being of Man and his relation to soul and body. It explains the action of the mind, and how it is the connecting link between God and man; also how mind action affects the body, producing discord or harmony, sickness or health. It shows what the faculties of man are, their relation and how to develop them, as symbolized by the type-man, Jesus Christ, and his twelve disciples. “We have the mind of Christ.” — 1 Cor. 2:16. It explains why a failure to bring forth these faculties, or their misuse, is a falling short of the God-idea, the “image and likeness,” and which falling short is sin. It explains how man has thus fallen short and brought upon himself sin, sickness, poverty, sorrow and death. It shows how all these conditions can be overcome and a new relation established between the Creator and the created. It explains in a rational, comprehensive way the mission of Jesus Christ, the atonement he made for us, and how we may take advantage of it. It interprets the Scriptures as a whole and shows them to be a wonderful revelation to man, explaining his origin, his development and his destiny. It bridges the gulf between science and religion and shows the New Testament to be an arcanum of the subtle forces underlying all manifest life, and which are now being discovered by the advanced schools of physical science. It solves all the problems of existence and brings man into understanding of Divine Law, harmony, health, and peace, here and now. It is pure Christianity and proves itself to be such by the signs which follow its exposition, as promised in Mark 16:17, 18 and 20. It admits and accepts the truth that is expressed in any system of religion, but does not confine itself to any set creed or dogma, or to any fixed name or organization. It accepts the Gospel of Jesus Christ as the highest given to man, and recognizes but one source of revelation for that Gospel: “Even the Spirit of Truth—which is the Holy Ghost, whom the Father will send in my name, he shall teach you all things, and bring all things to your remembrance whatsoever I have said unto you.”—John 14:26. Its disciples seek to fulfill all the commands of Christ: “Preach the Gospel,” and	“Heal the sick, cleanse the lepers, raise the dead, cast out devils: freely ye have received, freely give.” Matt 10:8; because they accept literally his prophecy and promise:	“He	that believeth on me, the things that I do shall he do also; and greater works than these shall he do.”—John 14:12. This great truth is being applied in a most practical way by thousands, and they are getting the results in newness of understanding, strength and health. You are cordially invited to join in the work of revealing this transforming truth to humanity, and through it reap the great benefits in mind, body and affairs with those who are putting it into practical use. 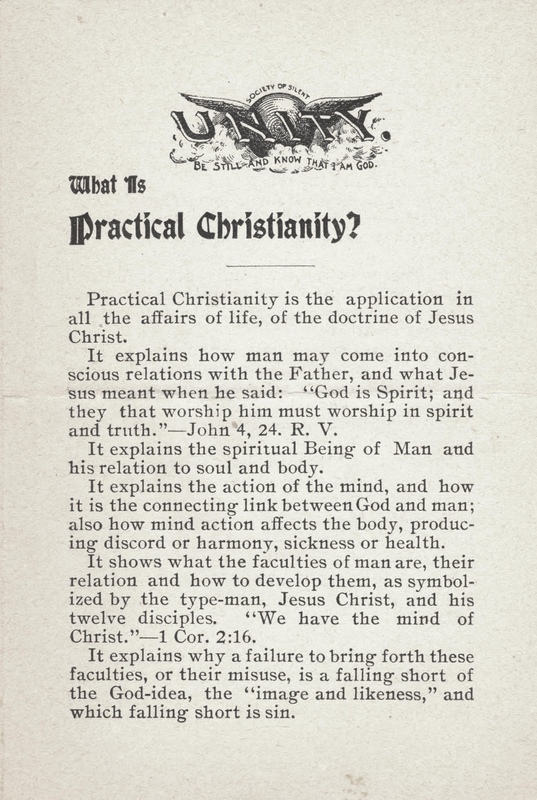 Monday Evening, January 17th, 1898, at eight o’clock, in Rooms 510-511 Hall Bldg., Kansas City Mo., we shall begin another course of instruction, consisting of lessons in Practical Christianity and Christian Healing. Students are here instructed in the great mysteries of Being “hid since the foundation of the world,” they are taught how to instruct and heal others, and they are healed themselves. 510-511 Hall Building, Kansas City,	Mo. 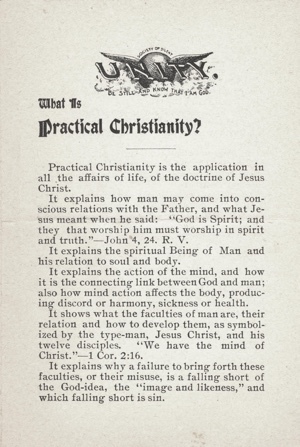 Subscriptions taken for Unity, a magazine advocating this doctrine, published at 511 and 512 Hall Building, Kansas City, Mo. Subscription, $1.00 per year.